Clary grew up in southern Appalachia surrounded by beautiful mountains and waterways, but she knew that just down the road were coalfields where the mountains were getting their tops chopped off for easier access to the coal. From an early age she knew that she would pursue a career in helping the environment and she went to Appalachian State University with that in mind. She was an activist during school, studied the sciences, and through extracurriculars worked to bring renewable energy projects to the campus. After school she became a community organizer and had the opportunity to work on campaigns such as anti-fracking in New York State. 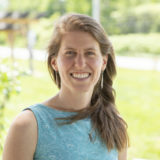 She eventually moved to Vermont and has been with SunCommon since 2012 on the organizing team helping make solar the norm and giving all Vermonters a way to move our energy usage away from dirty energies and toward clean renewables. Her passions outside of SunCommon are AcroYoga, biking and hiking, and like the rest of us, she loves Vermont.